Since 5 February 2011 nothing more can be heard. What remains are 24 hours of duration. This duration is essential to the artistic work. It will remain for an indefinite period of time, accessible on this web page. The 24-hour audio recording was made by Christoph Korn on June 22 and 23, 2007. The section of the forest where the recording took place is located near former concentration camp Dachau/Germany. "Section of a Forest" is solely a piece of work about this section of a forest. No statement is made about "Dachau", neither is there an intention to do so. The work, however, searches for the proximity to what "Dachau" stands for, about which it cannot say anything. 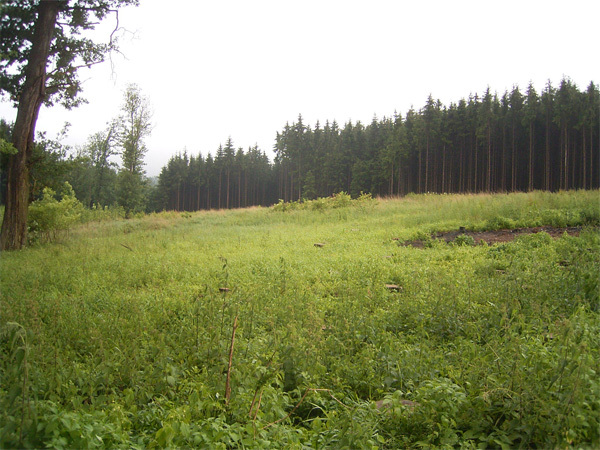 Section of a Forest, where the audio recording took place. Photo taken on June 22, 2007.